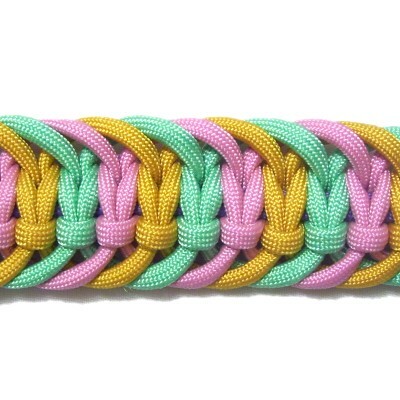 Description: Fish Bone Designs are vintage Square knot patterns featuring wide picot loops. 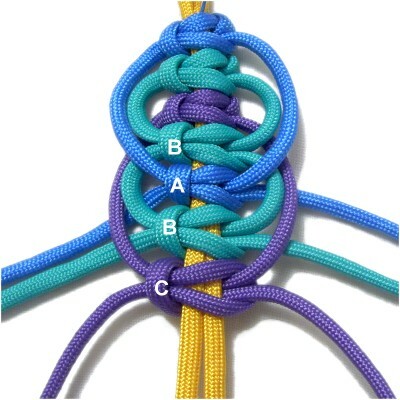 Three or more working cords are used in an alternating pattern to form the interlocked picots. 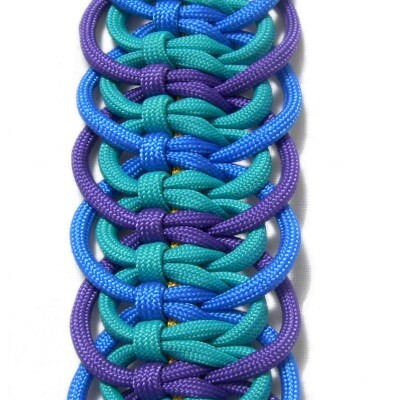 It's possible to make these decorative knots with a single color when you use them in a Macrame project. The details won't be as obvious as what you see on this page. When practicing, use three colors if possible. On this page are the Standard Fish Bone and a variation I call the Alternating Fish Bone. The beaded Fish Bone is no longer on this page. Both designs are suitable for belts, bracelets, plant hangers, purse straps, and similar projects. 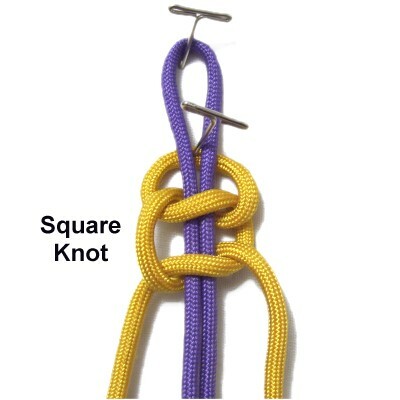 Make sure you know how to tie Square Knots before you get started. Preparation: You need three 60-inch working cords and one 30-inch filler cord to practice this technique. The working cords need to be 9 x finished length you plan to make if you are using this design in a Macrame project (Fish bone only). In other words, Fish Bone Designs require more material. Take that into account when you make your calculations, especially if there are other knots being tied. You can make Fish Bones without folding the cords, which is often done if the cords are coming from other knots, such as in a plant hanger. In that case, you would need 6 working cords and either 1 or 2 fillers. Step 1: Fold the filler cord in half and secure it to your board vertically. Place one working cord underneath, and match the ends to balance it. Secure it at the center. 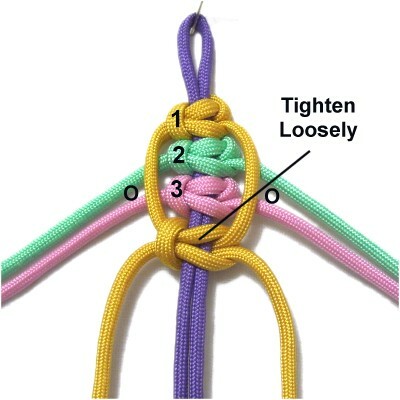 Tie a Square Knot with the working cord. Step 1, continued: Repeat the same process with the other two working cords, attaching them to the filler cord in the same manner. 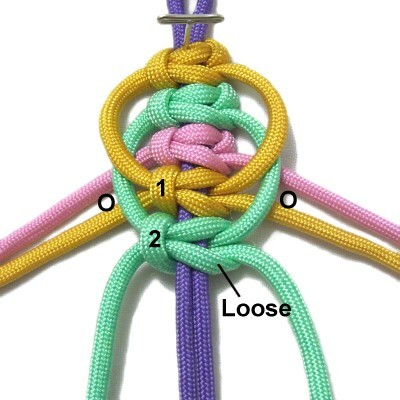 Tighten all the knots firmly and move the knots so the loop (fold) is the right size for your project. Mentally number the working cords in the order they were attached to the filler cord. Place pins on your project board so the unused cords in each step can be draped over them. Step 2: Place cords 2 and 3 over the pins (both halves). Pass both halves of cord 1 over them, then use it to tie the next Square Knot onto the filler cord. 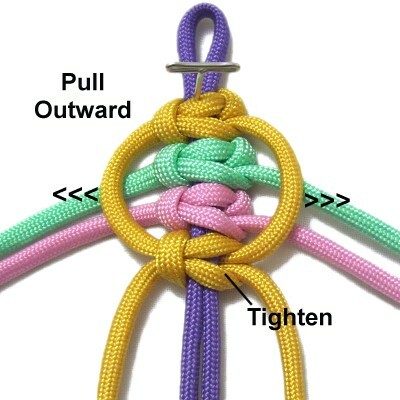 Form the picot loop by pulling outward on the segments between the two knots. Try to make the total width more than 1-inch, unless the material is less than 4mm in size. Step 3: Move each half of cords 1 and 3 to the sides, draped over the pins. Pass both halves of cord 2 over them, then use it to tie the next SK onto the filler cord. Tighten it loosely. 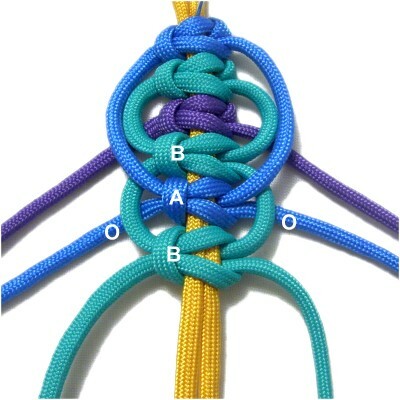 Pull outward on the segment between the knots to form the picot. 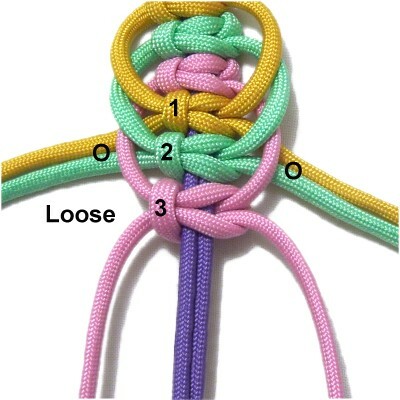 Try to match the width of the first picot loop. Tighten the Square knot firmly. Important: When making Fish Bone Designs, it's important to keep the picots the same size, so the width will be consistent. Use tape or draw guide lines on either side of the sennit, and pull the picots out to the marked areas. 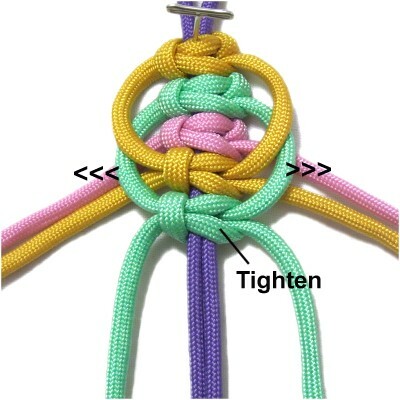 Make sure the knots are touching each other without extra space between them, because the picots can change size if the knots move. Step 4: Move each half of cords 1 and 2 to the sides. 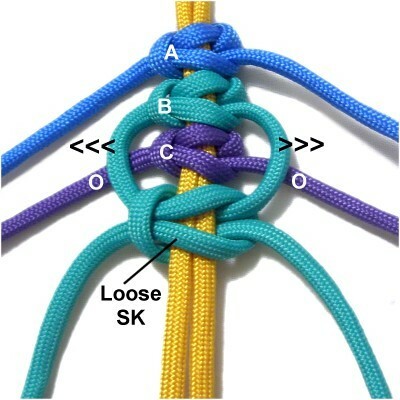 Pass both halves of cord 3 over them, then use it to tie the next SK (loosely tightened). Pull outward to form the picot, then tighten the knot firmly. Step 5: Repeat steps 2 - 4 at least two more times if you are practicing. Fish Bone designs look unbalanced if they are too short, since they are wider than other sennits. Keep that in mind when using them in Macrame projects. Description: Fish Bone designs can be made in unusual ways. This is my own invention, but I'm sure someone has tried the same approach. 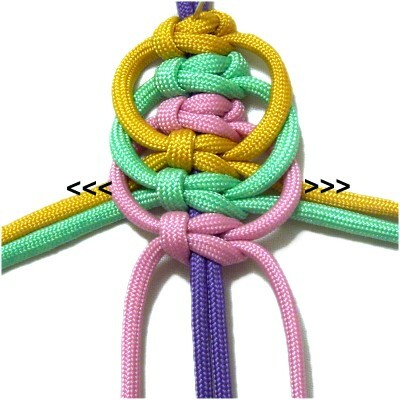 One cord is used to make small picot loops. 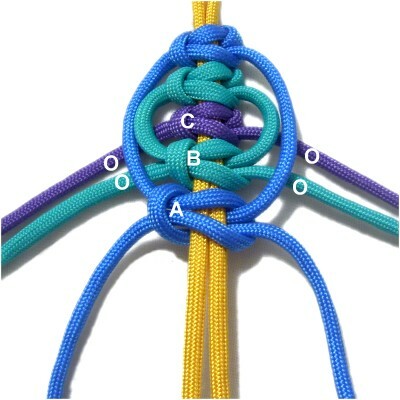 The large loops surround the small ones, which are made with the other two cords (colors alternate). The small picots are made with the turquoise cord in the images (cord B). 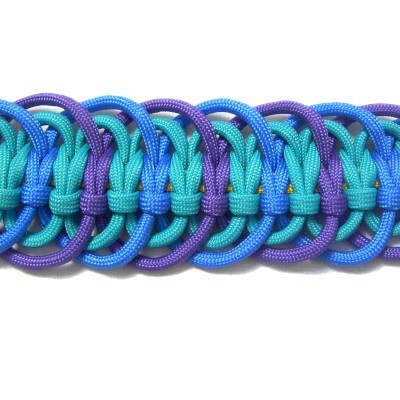 It needs to be longer than the others because it's used to tie more knots. Take that into consideration if you are using this design in a Macrame project. Remember to place pins on your board so you can drape unused cords over them for support. Preparation: You need one filler cord folded in half and secured vertically on your board. You also need three working cords. Mentally label them A - C. When practicing, all three cords can be the same length (60 inches), but it's better if cord B is at least 70 inches. Filler cord: At least 2 x the finished length + 6 inches. Working cords A and C: At least 9 x the finished length. Working cord B: At least 10 x the finished length. Step 1: Repeat step 1 from the instructions for the standard Fish Bone (above). Make sure the longest cord (B) is placed between cords A and C.
Step 2: Move cords C and A over the pins. 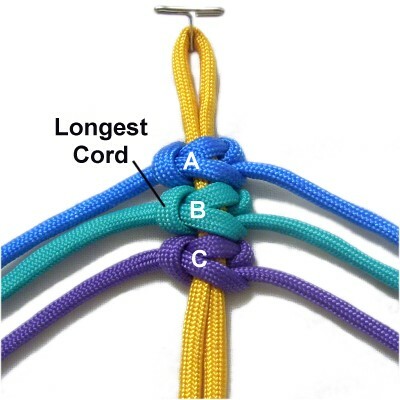 Move both halves of cord B toward you, passing over cord C. Use it to tie a loose Square Knot around the filler cord. Form the picot by pulling outward, then tighten the knot firmly. Step 3: Move cords C and B over the pins. Move cord A around the picot and over cords B and C on both sides. Use it to tie the next SK, then form the picot and tighten. Designer's Tip: Don't be surprised if the first two picots look a little odd or uneven. Balance them the best you can as you adjust their size. Step 4: Move cords C and A over the pins. Use cord B again, making the next picot as you did in step 2 (small). Step 5: Place cords B and A over the pins. Move cord C around the previous picot, then over the other two working cords. 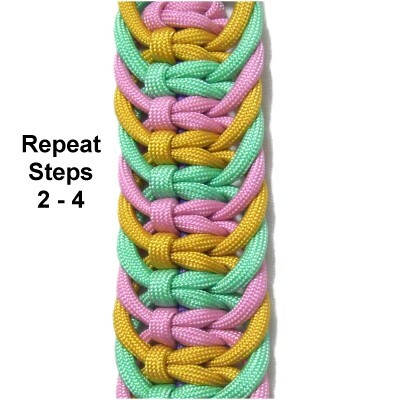 Use it to tie the Square knot, adjusting the size to match the one from step 3. Step 6: Repeat steps 2 - 5 at least 2 more times if you are practicing. Fish Bone designs are usually longer than other sennits, to balance the length with the extra width. Have any comments about the Fish Bone Designs? Contact Me.